The color variant was available on the GameStop rewards website and required PowerUp Rewards Points to purchase. The fade edition was available for sale at the GameStop booth at the Fan Expo Dallas comic convention. 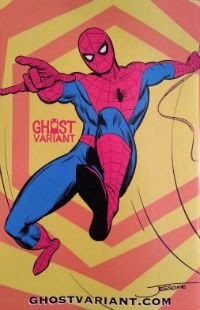 This variant was produced for stores participating in the Ghost Variant program. This information is gathered in part through the tireless efforts of the commenters below and the members over at the ComicBookRealms.com forums. Please feel free to contribute. I checked with Zapp directly and they said they didn't like the look of the sketch version, so it didn't happen. I'll keep my eyes open for a sketch version on the Forbidden Planet site. Thanks Andrew! At least that is one less I/we have to concern ourselves with. When do you think Marvel will provide a listing of all the stores that participated? I spoke to someone at diamond today...there is a total of 45 variants (including the 11 produced by marvel) unfortunately, she was unable to tell if the Diamond Summit and Atlanta Con variants were included in her information, so it could actually be 47 or 48. That's great intel Dark Passenger. I'll see if I can find out anything from some of my other sources. I spoke to my dad, who spent decades in publishing, and we both agreed that if the artwork was finalized, which it obviously was, the Diamond Summit and Atlanta Con variants should be included in the 45. Having said that, this is what I've got so far. I'm currently adding the new Newbury issues to the list above, but could only find a color version of the Game Stop issue on their site. Do you know for sure there is a sketch version that will be available? 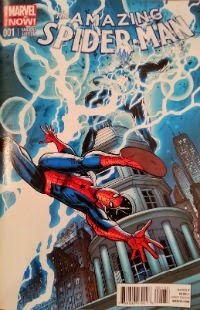 no I don't know if there is a sketch for Game Stop but on the Denver Comic Con site they list Horn as a guest and state that he has done 2 covers for ASM 1. I assume its the same cover just a color and a sketch version. However, I will be setting up C2E2 and will try to track down Greg Horn and get more info. Excellent. I look forward to seeing what you can find out. Thanks for the intel. I updated the list above to include everything known to date, and by my count there are 44 so far. The end is near. Lobo, great find on the sketch finally showing up on Hastings. I updated the links above directly to those pages. Caught your last note before you removed it about the Game Stop sketch. Have you seen anything about that? I've only heard rumors. I've heard there is a Greg Horn sketch but I'm not sure if it's for GameStop. Can you fill us in on the rumors you heard? 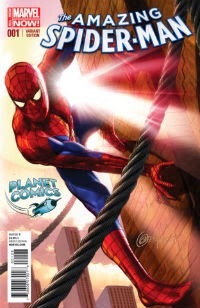 The only thing keeping this rumor alive for me is a mention in his bio where he will be appearing at the Denver Comic Con that says he "...will be providing two of the variant covers for their block-buster release of Amazing Spider-man #1..."
We know that Game Stop is one variant he has created, and he either has a sketch version of that, or another design all together. Or the bio is wrong. I've reached out to him by email, but have yet to get any feedback. Just posted the full cover image for the Greg Horn GameStop version up above. He has one posted to Ebay for north of $200, and doesn't say anything about a sketch version. I don't think it exists. yes he states that the sketch version will NOT be used for his remark copies that he will remark so he confirms that there is a "half sketch" for this variant. With the added sketch confirmed for Game Stop, we are finally at 45 total books. That just might be the full set. While I agree there is a sketch version from GH, I'm not sure if it's for GameStop. If you read the description in the listing on eBay, it says all sketch books were sent to the buyer and that GH won't be receiving any copies. I assume that if he did receive some colour copies from GameStop then he would also receive some sketch copies as well. The auction states that "...none are being mailed to Greg." I am assuming the "initial buyer" being referred to is GameStop, and I have an inquiry out to GameStop to try to get some more info on the variant. Interesting. Greg Horn, the cover artist, mentions it in his ebay auction for one of the color copies. This new info makes me wonder if the sketch fade version he is talking about really went to another dealer -- what Kuddy was alluding to up above. Did you get your Hastings Sketch pre order in today? Sure did. I have all the variants pre-purchased except for the con variants. Agreed, I still think there's to many variants, but I'm old school. I love all comic characters, but spider man is one of favs, and I feel Sony is not creating the characters properly in the movies, but oh well.. So here's a quick follow-up on the Greg Horn sketch version: I asked Greg Horn (through Ebay)... "Do you know if they (GameStop) are also producing a sketch version of the comic with your cover?". He replied... "Yes they are, but they did not send me any, so there will be NO HEAD SKETCHES ON THE GAMESTOP SKETCH VERSION." So the artist surely feels that GameStop has a sketch version, but word from one inside source at GameStop says no. And I have a feeler out to Diamond to see if they can provide a list of participating retailers. Andrew, just seems odd to me that the artist with whom GameStop contracted is sure they also did a sketch. Wouldn't he know better than some GameStop people? Can't wait to find out what Diamond's response is. It does make you wonder why they did not put the sketch up for sale as well unless the only thing I can think of is it is a marketing ploy for people to spend more $$$. List the color first and get a bunch of people to use their points, then weeks later release the sketch and have those same people who now used up all their points need to buy more to get the sketch. Just a thought. Justin M. Let me know if you have any luck on the GameStop sketch. Your sources may be our best lead yet. Zapp comics has confirmed no sketch variant will be released, I just talked to them. And how do I get the Stan Lee variant?? For now, ebay is your best bet for the Stan Lee variants. My assumption is that it will be available at upcoming conventions through the summer otherwise. OK...I think I have uncovered the truth. I spoke to Greg Horn this morning and this is what he said. Game Stop has solicited a color and a sketch variant. The color we all know about, but this is what he told me about the sketch. He believes that Game Stop will save them for sale at a convention, most likely Dallas. Which may make them easier to obtain, certainly cheaper. But wait! There's more. 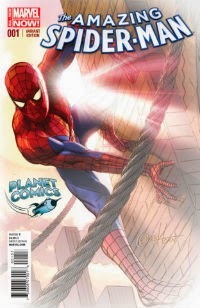 GH did another, different cover for Planet Comics in SC and, of course, there is a color and a sketch version. Also I should mention that the M&M and DF books are exactly the same, I was told this twice by the owner of M&M. He commissioned the cover and is simply using DF as another avenue to move product. It makes sense that the book may be released at The Dallas Comic Con in a few weeks. While there is nothing on their site, there is one page that discusses their ticket packages. And in the graphic it mentions an Exclusive Comic (http://www.fanexpodallas.com/tickets/#packages). That may be the GameStop sketch. Great intel! I did take a look at Planet Comics site and FB page but didn't see anything about an exclusive. Hopefully, they'll post something soon. You're in Texas aren't you? We may have to talk off-blog lol. I am, and I wasn't planning to hit the Dallas Comic Con this year because it isn't especially good for back issues. But now I am reevaluating to see if I can make it. It's still a few weeks off, so chances are good I make it now. I'll update as I know if I'm making it to the show, and especially if they update their site to show the exclusive comic they will have. So, what's stopping you from buying a ton of copies and putting a PAYPAL button on this page and re-selling?? You'd have orders from me!!! I heard back from a Planet Comics rep this evening, and have posted links to their website (up above) where you can order the two variants they have. I also pulled off the GameStop sketch variant, as it will likely turn out to be for Fan Expo Dallas instead. But that is yet to be determined. My GOD this is starting to get really expensive! I need to save for shows and autographs and CGC fees, this year is killing my budget.. Marvel is killing me! Then they just announced the Death of Wolverine, FML I am sure there will be so many variants. We are on fire tonight. Just got confirmation that Fan Expo Dallas will have an exclusive variant as well. The picture is going to be released next week. I'll update the list once it's out. WTF.... this was supposed to stop at 45! I'm hoping t be able to make it to the Dallas Convention, but I won't be at Atlanta or Regina. I think they will be plentiful on Ebay for a fair price after the shows are over. Andrew, I am willing to give you some extra $$ for your troubles if you can pick me up a copy at the Dallas show if it indeed turns out to be the GameStop sketch. How will they handle the Exclusive at Dallas Comic Con? I didn't get the ticket with a free copy. Can I still get one or more? Are they for purchase? The Dallas Comic Con folks let me know they would be releasing the details of their exclusive variant sometime this week. Check out nycomics.us. They have the Stan Lee variants for sale. They also have 2 more different Stan Lee Scottie Young variants not mentioned here yet. Just found that the two Sottie Young are actually reprint variants of issue 9 and 14. Yep. I don't have them in hand yet, but ordered. Not sure what they were produced for, but likely as convention giveaways for someone. Separate from the ASM variants, but still cool collectibles. They are reprints of the first appearances of Electro and Green Goblin. Villains in the New ASM2 movie. If you look close Stan is reading issues 9 and 14. ah well another gimmick to sucker us in. Love them SY baby covers and this one too. Well, I have good news, bad news, and worse news. 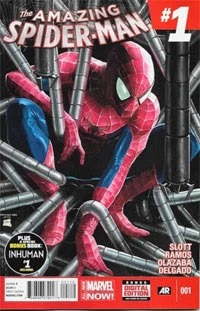 The good news is that Fan Expo Dallas has released the cover for their Amazing Spider-Man #1 exclusive cover variant. The bad news is that it's the same cover as the one we already knew about from the Fan Expo Regina show, and that makes sense I suppose. The worse news is that there's "apparently" still a sketch version of the GameStop variant that was confirmed by the cover artist Greg Horn, but nobody else knows anything about it so far. Not even some GameStop insiders who have been asked. So here we go guys. Who can find out more...? Thanks for the heads up Kuddy. I added the Strange Adventures variant to the list. Looks like it will be available from their website next week sometime. Just posted another new variant. This time a Ghost Variant cover. Check out the front and back cover up above. 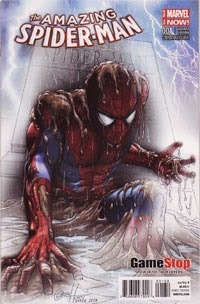 Yeah, guys, I give up, I just had a money emergency, I have to liquidate my entire comic book stock including all the spider-man vol 3 #1 variants I just bought, I'm gonna just auction them off at (www.noreservecomics.com) medical issues are ruining my wallet, it was fun tracking it while it lasted..
Just realized the Strange Adventures variant posted yesterday morning and the Ghost Variant posted last evening are the same cover. The Strange Adventures is likely not a unique book, but just one of the Ghost Variant issues - to which they are a member. I need someone to eyeball the actual cover, though, to make sure it doesn't have a store logo on it. I just confirmed that the variant previously associated with Strange Adventures is in fact the Ghost Variant, which is associated with several stores. The list above has been updated. So we are at 36 variants and counting. Just updated the list following a confirmation that Dynamic Forces does not have their own exclusive edition. They are reselling the M&M version. This appears to be a blatant bait and switch situation where they were even displaying a different version of the cover (without the M&M logo on the cover). Any nowhere in the description did they mention it was the M&M version, which they do when reselling variants from Midtown Comics. Very shady business practices. Shame on you Dynamic Forces. I fell for this. I pre-ordered the M&M variant through them at half the cost. I thought I was getting a DF variant when I saw that they were selling one. Very disappointed. Are you still planning on attending the Dallas Comic Con? If so could you please pick up a copy of the Game Stop sketch fade for me? I can Paypal you as a gift please PM me over on the CBR boards either way. Was there three different game stop covers? Dark, slightly light and very light. I've come across this recently. There are only 2 versions of the Gamestop variant -- a regular color cover, and a color fade version. If you are seeing a 3rd version, please post a link, but it may just be a printing issue. 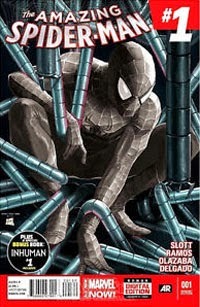 Amazing Spider Man variants are out of hand!!! Oh well good luck spidey fans I hope you don't go broke! Correction: I meant "Remaining Variants"
Add in the 1.1, 1.2, etc variants and this has been a very expensive few months. I love the variants but this is crazy. I went crazy in getting all the #1 variants (thus far) because I missed out on getting all the #666 variants and I thought it was a cool one time idea. This will be my last go around getting 40-something variants of one issue. This has definitely soured me.